SEOUL, Nov. 22 (Yonhap) — South Korea is considering various possibilities for how to handle the funds provided by Japan to establish a foundation on wartime sexual slavery, Seoul’s top diplomat said Thursday. At issue is what to do with the funds Japan provided. According to the government, 5.8 billion won ($5.1 million) remains; the rest was disbursed, mostly to late comfort women’s families, and used for the operation of the foundation. Most of the surviving comfort women refused to accept money from it. 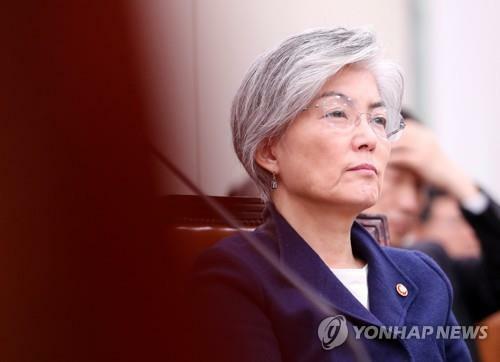 “We will have to consult (with Japan) on the issues of the remaining funds and 1 billion yen provided by Japan,” Foreign Minister Kang Kyung-wha told Yonhap News Agency. “Various options are being considered. On Tokyo’s protest against Seoul’s decision, Kang said her ministry would not “overreact” to it. Prime Minister Shinzo Abe publicly said state-to-state relations can’t exist unless a formal promise is kept, responding to Seoul’s announcement on the foundation’s dissolution.